There is something special about traveling by train and seeing a new country passing by your window while you sip some tea or wine. Even better when the landscape is incredible India, a country packed with unique architecture and stunning beauty. During our 7 days on Palace on Wheels train, we saw the best of Rajasthan and visited the majestic Taj Mahal. We explored this intriguing part of India pampered by royal service, private tours, lovely staff and yummy food. 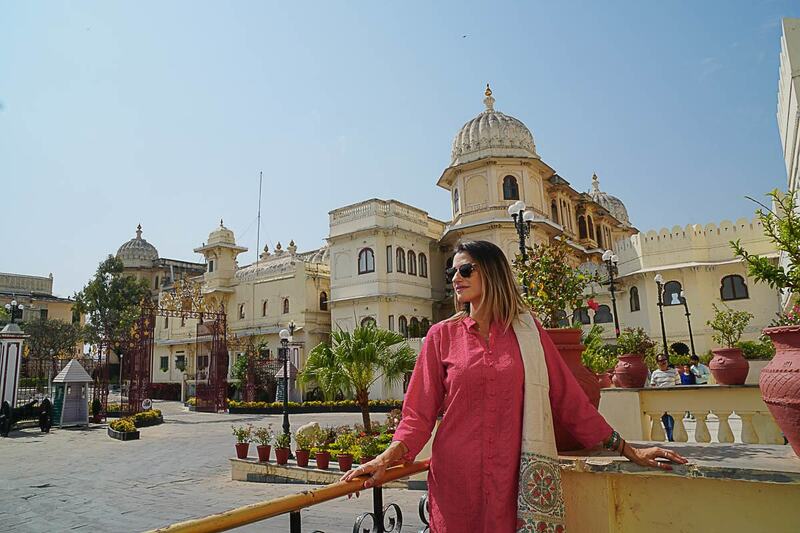 After a week of living like Maharajas, it’s time to share our thoughts about this luxury train in India, so here goes our Palace on Wheels review. Our Palace on Wheels review will be divided into 6 topics, so we can explain the whole experience. We’ll be talking about the Palace on Wheels route, attractions, tours, service on board and what is included in the price of the train journey. Plus some tips on how to plan a luxury train trip in India. What is included on Palace on Wheels package? The Palace on Wheels train tour is an all-inclusive trip, so from the moment you board on the train you don’t need to worry about anything anymore. 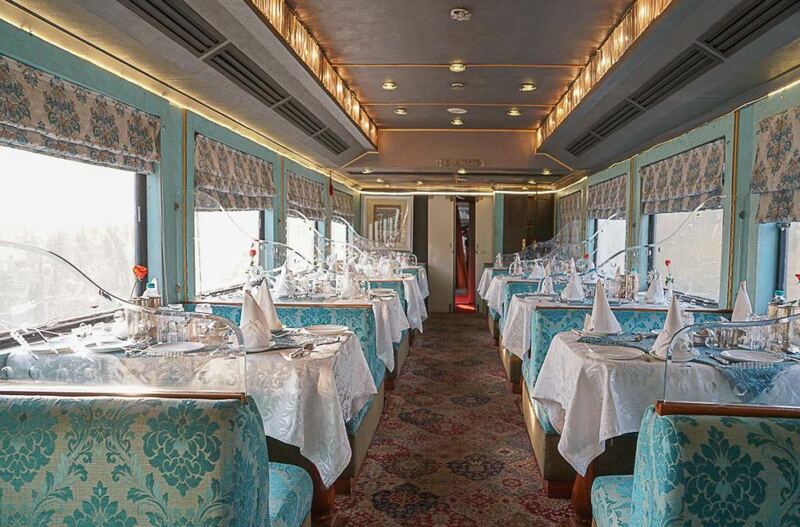 Accommodation, food on board, tours, entrance fees to the touristic attractions, transfers from the train stations to the attraction sites and back, lunch or dinner in the cities you will be visiting and a dedicated butler that will take care of you during the entire trip are all included in the Palace on Wheels price. What really stands out is the fact that you don’t need to worry about how to visit the cities or attractions. As soon as you board on the train you will receive a Palace on Wheels pin and you must keep it with you at all times, this is the ticket you will need to show at the places you will visit in Rajasthan. You won’t need to queue, get paper tickets or book anything in advance, just show your Palace on Wheels pin and the doors will be open for you. On top of that, you’ll have a guide from the train plus a local guide with you all the time, and they do speak perfect English. If you need a toilet break, some water or food, just ask them and they will sort it out for you. It’s a truly hassle free experience, you only need to bring your clothes and leave the rest for the Palace on Wheels team to look after. They even know what time you will need to wake up, and the wake up call will come accompanied by freshly brewed coffee or tea served in your cabin. It took us a couple of days to get used to so much attention and care, but now that the trip is finished I do miss O.P. and Pharad, our lovely stateroom attendants. 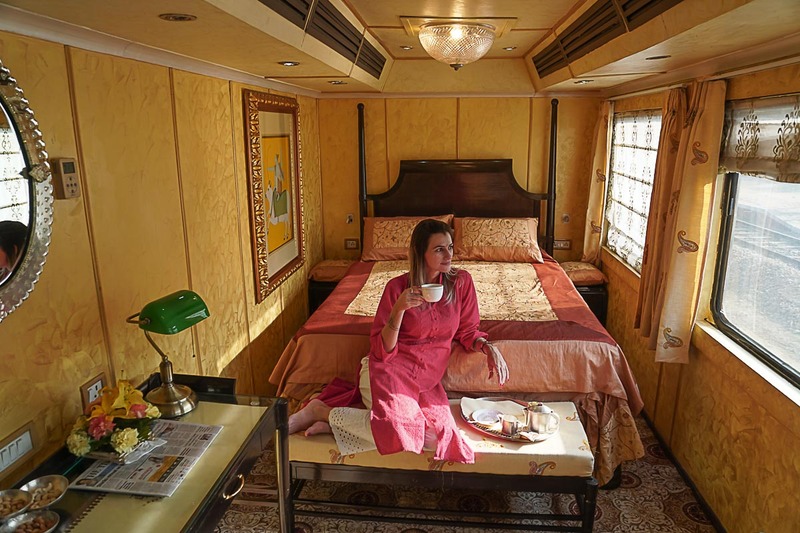 The Palace on Wheels train will be your home for 7 days and they do provide everything you need for a comfy stay. The train is huge, it has a total of 39 Deluxe Cabins and 2 Super Deluxe Cabins, and you can choose between single or double occupancy. The train has a maximum capacity of 82 travelers and all cabins have a private bathroom, a small wardrobe, a coffee table, chairs and a butler to take care of you. We stayed in one of the Super Deluxe Cabins, with a huge double bed, working table and a spacious bathroom. The train is fully air conditioned, the water in the shower is steamy hot and they offer internet connection, although the wifi is not reliable as the train travels through areas without 3G or 4G coverage. There are also two restaurants/bars on the train and an Ayurvedic Spa offering massages and treatments. If you feel like exercising you can use the treadmill or the stationary bike at the Palace on Wheels Spa. The train is super comfortable, there is no doubt about it, but many travelers complained it was hard to sleep due to the noise and movement of the train. Most of the traveling is done overnight and I recommend taking some motion sickness pills just to help you relax and have a good night of sleep. Palace on Wheels tour is intense and you need to have a good night of sleep to face the full days of activities and tours in Rajasthan. 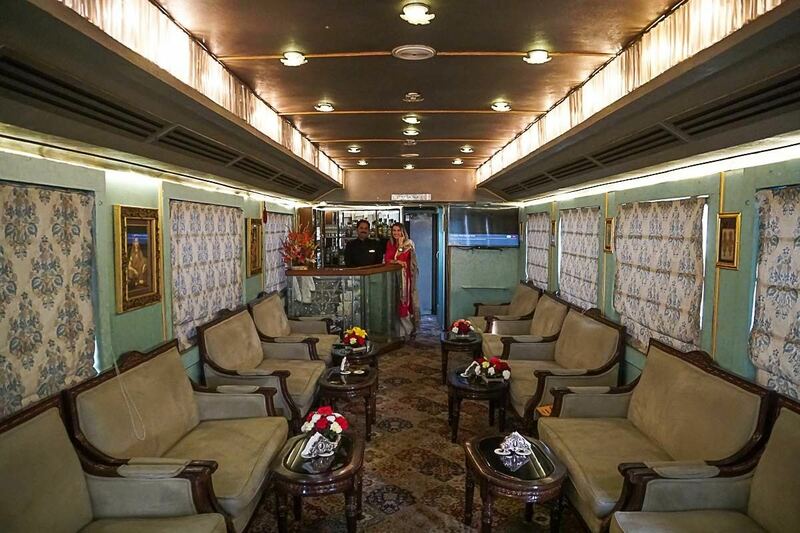 Another thing you must keep in mind is the Palace on Wheels interior décor. It’s considered a luxurious train and it has been nominated by PATWA as one of the Best Tourist Trains of the Year, but it’s completely different from the type of luxury we see in the western trains or hotels. Palace on Wheels is like a trip to the past, to the royal times of Rajasthan when the Maharajas and Maharanis used the train to travel across India. Colonial wooden furniture, draped pink curtains, fluffy colored rugs, silver cutlery and staff wearing the traditional Rajasthan turban… This is the type of luxury décor you will find on the train. 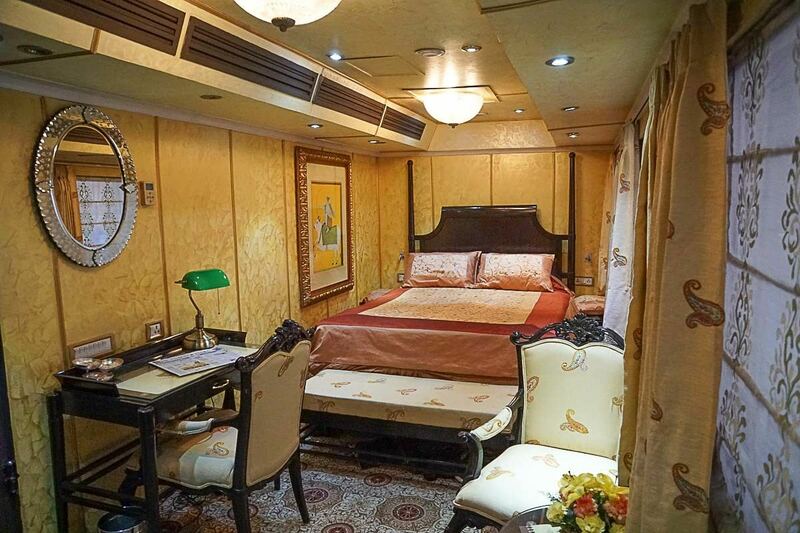 If you come to Palace on Wheels expecting to have a luxurious minimalist room, with modern art and impersonal staff, you will be disappointed. Palace on Wheels is the opposite, it’s warm, it’s vintage and it’s unique, it’s a very luxurious train, especially for Indian standards. The Palace on Wheels route is the highlight of the trip. 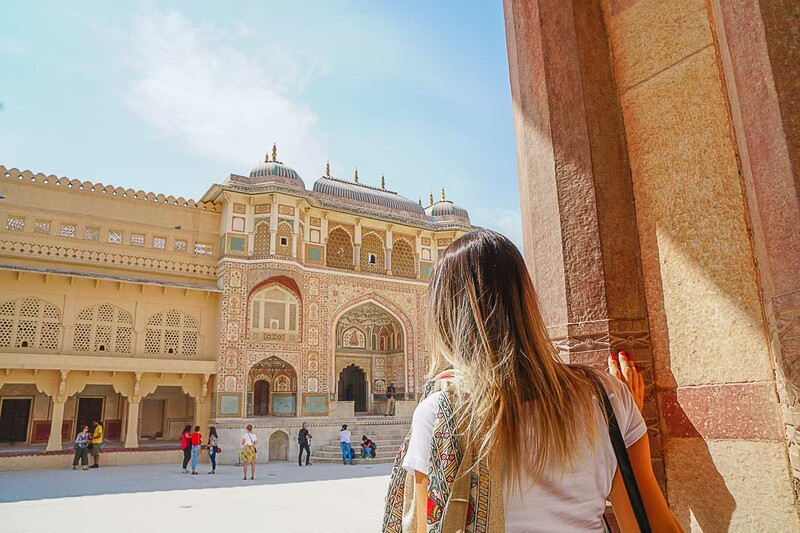 Comparing to other luxury trains in India, Palace on Wheels has the best itinerary for travelers who are visiting India or Rajasthan for the first time. 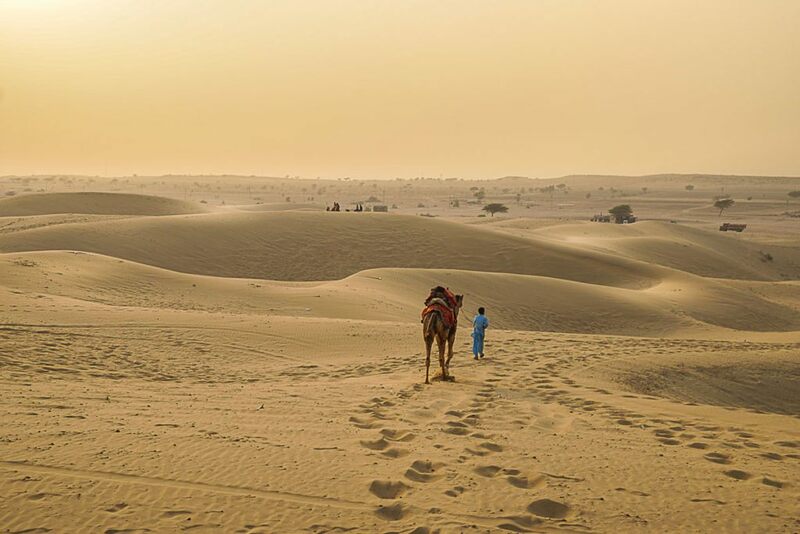 It covers the famous Golden Triangle [Delhi, Jaipur and Agra] and adds a couple of other places that are worth visiting in Rajasthan but are overlooked by travelers due to the lack of time or for being hard to reach. Because you are on a luxury train tour, you can do a lot in one week. If you had to travel by regular train, bus or even fly to the cities, you wouldn’t be able to visit as many places in 7 days. As the train mostly travels at night, every morning you wake up in a different destination and you don’t need to worry about checking in and out of hotels, packing, buying tickets to the attractions or buying food. The Palace on Wheels itinerary is a time saving option for those who want to see a lot in a week. 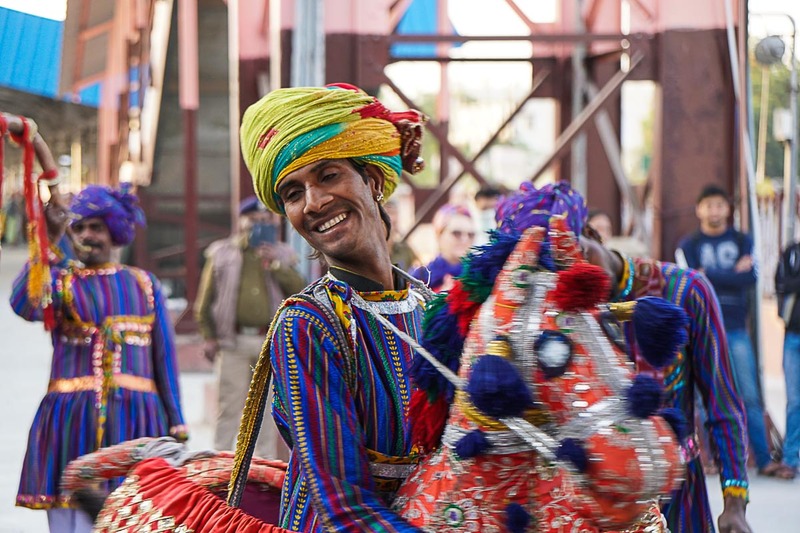 The cities and attractions visited during the Palace on Wheels tour are always the same throughout the year, but the order of places visited might change according to the weather, traffic or some festivities that might be happening during your trip. Palace on Wheels tour starts in New Delhi, at the Safdarjung Railway. Music, flowers and tons of smiles will welcome you at the station. After the check in all the guests are escorted to their cabins and at 6:30 pm the train departs. Dinner is served on board with a small ceremony talking about the history of the train and how the trip will be organized. Wake up early and be ready for a busy day. Elephants, dancers and musicians will welcome you at the station and from there a bus will take you to Jaipur. Our first stop was at Albert Hall Museum, a great introduction to the city’s architecture and life. Then we went to a gem factory and while some of the travelers stayed there watching the demonstration, we gathered a small group to wander around the neighborhood. Time for a delicious masala chai, street photography and to meet some locals. Next stop was at impressive Amber Fort. The bus took us to the foot of the hill and from there you can go up by jeep or riding an elephant. Please, please, pretty please, don’t choose to go by elephant, those animals have suffered a lot to be domesticated and serve the tourists. If you have no idea about all the cruelty behind the elephant tourism please watch this video. The jeep tour was great fun and we got to see the village around the fort. When we arrived at the top I couldn’t believe the size and the beauty of the fort and its walls. It’s magnificent! Take your time to walk around and discover more of its history by following the guide. Our lunch was at 1135 AD, a boutique restaurant that serves traditional recipes inside the fort. After lunch we were headed to the famous pink city, in Jaipur we visited Hawa Mahal Palace [just a quick look from the outside], stopped at the UNESCO Heritage site Jantar Mantar and we finished our Jaipur tour at the City Palace. After a long day, the dinner was served on board and we were ready to sleep and travel to our next destination. Our 3rd day on Palace on Wheels started early, very early. 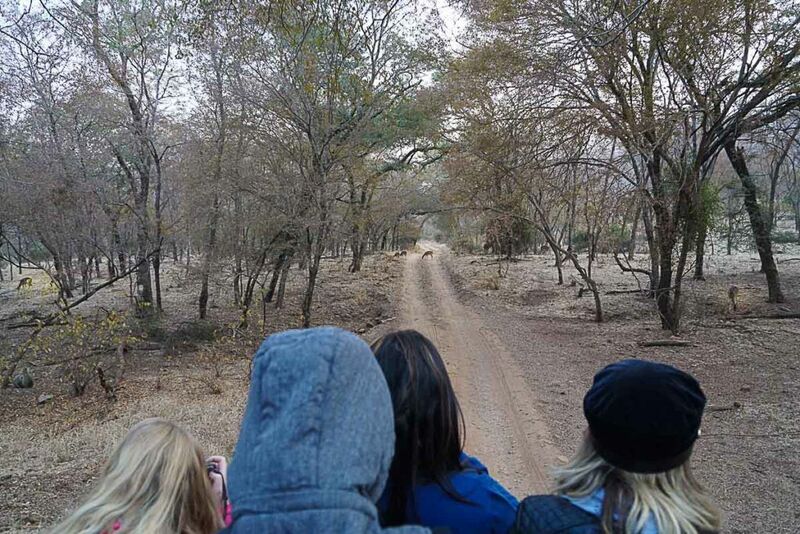 The wake up call was at 5:30 am and at 6 am the group left to visit the Ranthambore National Park. The sanctuary is famous for its great nature and tigers, one of the highlights of Palace on Wheels itinerary. I was sick the entire night so I stayed on the train while Rob went on the safari. They saw beautiful birds, deers and a female tiger sleeping behind the trees. All the travelers were thrilled by the unique experience despite the cold weather they had to face during the safari. After a couple of hours at the Ranthambore National Park everybody got back on the train for a proper breakfast, some rest and lunch. Around 10 am the train departed to our second destination of the day, Chittorgarh. At 4:30 pm the bus left the train station to visit the Chittorgarh Fort followed by a Light & Sound Show at the fort. As I was feeling unwell, Rob and I stayed on the train so I could recover for the next day. 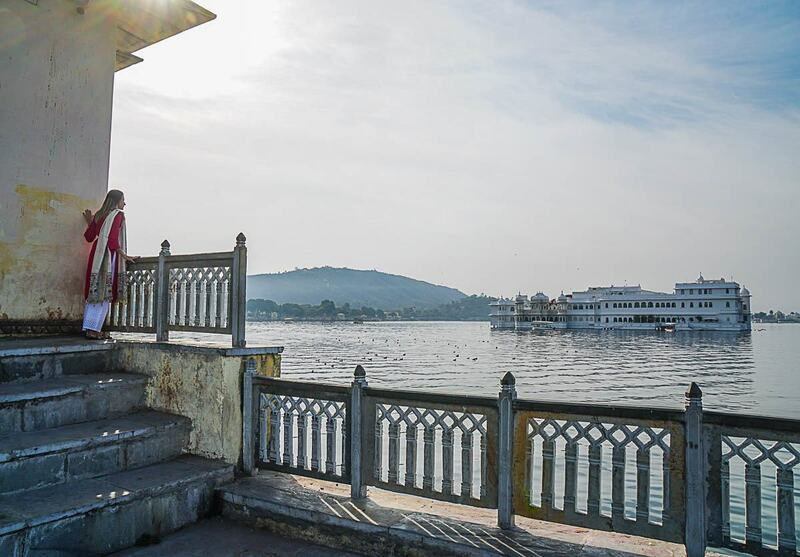 Our 4th day on Palace on Wheels was dedicated to Udaipur, the City of Lakes. We started our morning with an awesome tuk-tuk ride through the narrow streets of the city. Udaipur World Music Festival was happening that day and we had the chance to watch a morning concert by the beautiful lake. Next stop was at the Saheliyon-ki-Bari also known as the Garden for Maidens. The third stop was at a local cooperative where artists work on the traditional micro painting and you can buy the beautiful paintings or other Indian souvenirs and clothes. After shopping it was time to visit the Udaipur City Palace, another impressive building. The city palace was packed with tourists, some of the travelers from the train followed the guide but Rob and I decided to have a nice coffee at the palace garden. Sometimes the best thing to do is to contemplate the beauty. Next stop was at Crystal Gallery, just beside the palace followed by a great lunch in one of the royal saloons. Food was delicious and the view of Lake Pichola was stunning. After a busy morning, our afternoon started with a relaxing boat ride on Lake Pichola, passing by marvelous palaces that look like they are floating on the water. On the lake shore we could see some impressive havelis [Indian houses that are just pure work of art], women washing clothes and temples hanging over the water. After another masala tea in a beautiful palace in the middle of the lake, we were ready to get back on the train. After visiting Udaipur I thought it would be hard for us to be impressed by anything, the City of Lakes was just so beautiful. But the 5th day on Palace on Wheels managed to wow us even more. 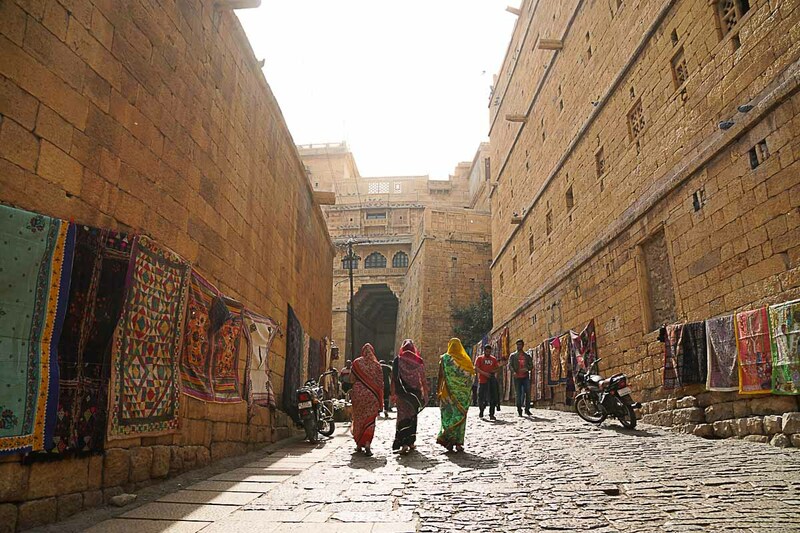 Jaisalmer was different from the other cities and forts we visited, it’s close to the desert and it’s the only fort in Rajasthan where life still goes on inside the walls of the city. The first stop was at Gadsisar Lake, a place that looks unreal with all the shrines and little houses hanging on its shore. A good place to buy cheap souvenirs that won’t last long, the sellers were friendly and you could get a little taste of street shopping. Then we went to Jaisalmer Fort, an impressive building that takes the whole skyline in the region. Once you enter the fort you feel like you traveled back in time. The fort looks like a Game of Thrones filming set. The rugs and clothes hanging on the walls make it look like a fairytale place, it’s so impressive that it looks unreal. It’s incredible that many people still live there, where they have their homes, shops and restaurants. After our incredible tour at the fort we ventured ourselves through the narrow streets of Jaisalmer city. It took us just a quick walk from the fort to be surrounded by traditional houses, kids playing, fresh markets and a lot of cows. The tour in the city ended in a rug shop, we skipped the vendors and got lost among incredibly old and beautiful rooms of the haveli. By 3 pm we were back on the train for a late lunch and then headed to Sam Dunes, a piece of the desert close to Jaisalmer. In the schedule we had camel rides followed by a sunset tea. The place was beautiful, but I found it a bit overcrowded with camels, chariots and people. And you only spend a few minutes riding the camels, so let’s call it as a little taste of the desert. However, the sunset and the masala tea with cookies were outstanding. Take a deep breath and be ready for one more activity, day 5 was the busiest day of the trip. After the dunes we went back to the train for a quick shower and a scrumptious dinner at a 5 star hotel close to the desert. Delicious food accompanied by traditional music and dance. 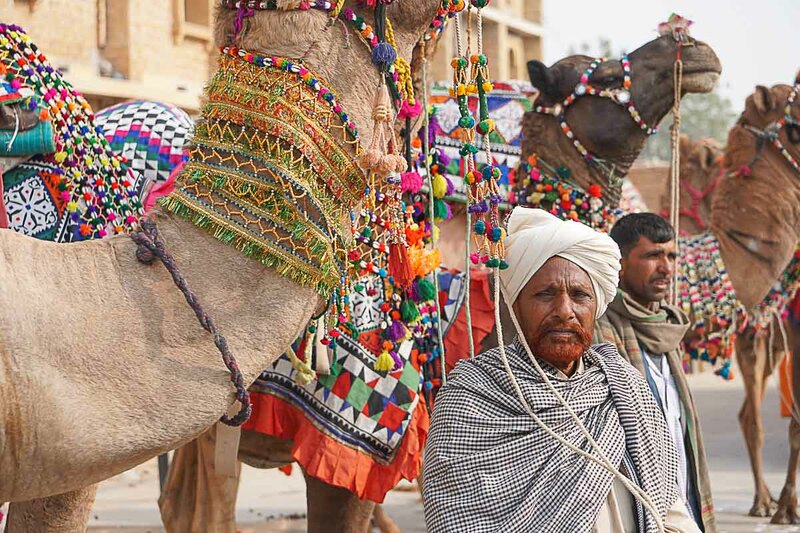 The 6th day of Palace on Wheels journey was dedicated to Jodhpur, the Blue City. We left Mandor station straight to incredible Mehrangarh Fort. The gates, the rooms, the courtyards, everything is so well preserved and so pretty. Make sure to wander through all corridors, you’re gonna discover amazing hidden corners there. Our second stop was at Jaswant Thada, a mausoleum built with white marble that shined bright under the sun. From there you can see the size of Mehrangarh Fort on the top of the mountain. After the visit, we should have gone to a shop to learn about local crafts, but we skipped it. 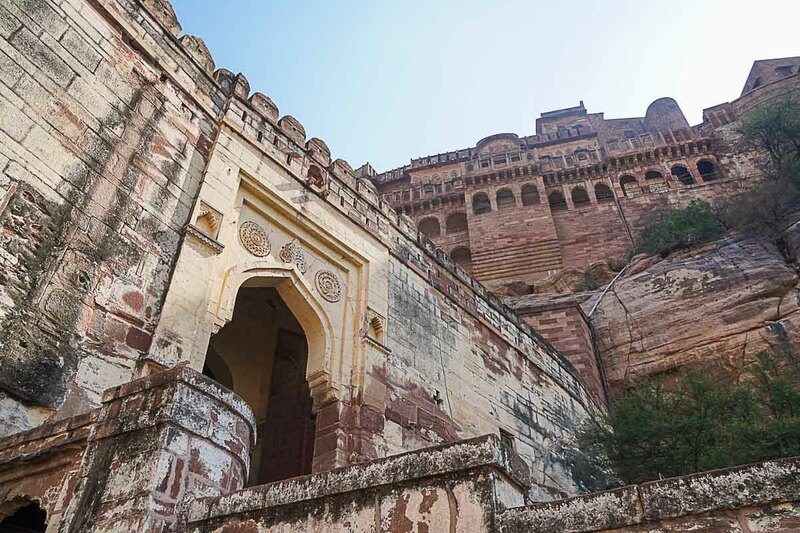 We couldn’t leave Jodhpur without seeing the blue city itself, so we gathered some people and our guide arranged a couple of tuk-tuks to take us to the city and then to our meeting point for lunch. That was when the real adventure began. We were running against time, so our drivers rushed to the blue city and we walked through narrow streets and alleys for almost 30 minutes. 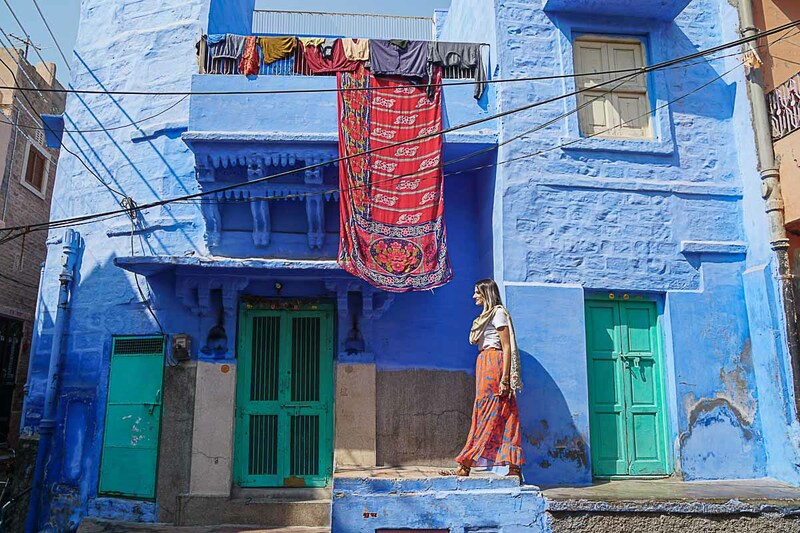 The city is truly blue, a paradise for photographers and we met some nice locals while walking there. A bunch of ladies sitting in front of their houses sang to us and a young lady called her entire family to introduce to us and to take a selfie. We were in a neighborhood far from the tourist attractions and that was one of the best encounters we’ve had, no hassle, no selling or buying anything, just curious and lovely people around. The tuk-tuk ride from the city to the hotel was an intense one. My heart skipped a beat or two whenever the driver crossed the traffic lights and entered the roundabouts. But it was all part of the fun, just perfect to make us super hungry and ready for the delicious lunch we had at fancy Ajit Bhawan Hotel. Jaipur was interesting, Udaipur was beautiful, Jaisalmer was a big surprise and Jodhpur was great fun. 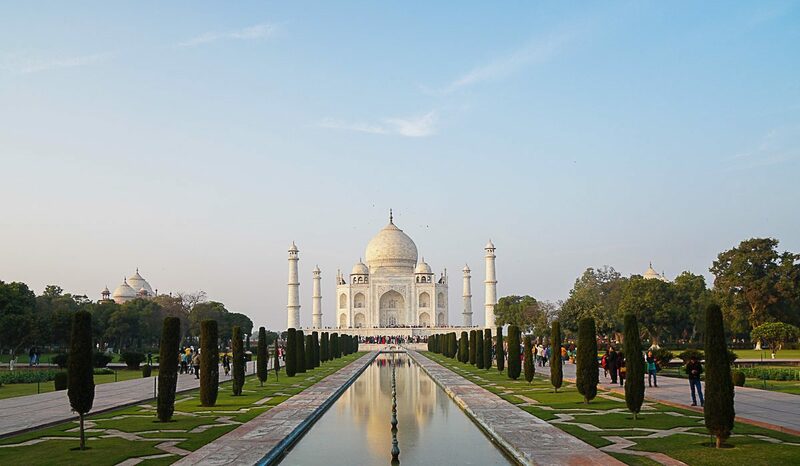 After all that we were ready for the biggest attraction of Palace on Wheels tour, it was time to visit Agra and the iconic Taj Mahal. At 7:30 am our train stopped at Bharatpur for a quick visit to Keoladeo National Park, a bird sanctuary. We were a bit tired after 6 days of intense traveling, so advised by our lovely butlers we skipped the national park to be well rested for Taj Mahal. After the visit to the bird sanctuary the breakfast was served on board and by 11 am we arrived at Agra train station. First a visit to Agra Fort, an impressive building but not as beautiful as the forts we saw in Rajasthan. Next stop was at Hotel Clarks Shiraz for one of the best lunches we had during the trip. The food was delicious [we can’t forget the paneer tandoori] but the view of Taj Mahal was even more impressive and memorable. At 3 pm a quick bus ride took us to the entrance to Taj, we passed by all the vendors, by the security check [read Taj Mahal the do’s and don’ts here] and there we were. It’s hard to explain how impressive Taj Mahal is and how emotional we got. As much as people say it’s overrated, I had goosebumps when I saw it for the first time. It was a dream coming true. I was visiting Taj Mahal, but better than that, we were there the day before Valentine’s Day. That was really romantic! Take time to wander around the garden, to visit the mosques sitting beside the huge mausoleum and take as many photos as possible, the building is stunning from all angles. During the afternoon Taj is packed with visitors, but we had an incredible sunset that made up for the busy visit. After sunset, we were ready to go back to the train and had a good dinner, but first, our bus stopped at a craft shop for a last minute purchase. 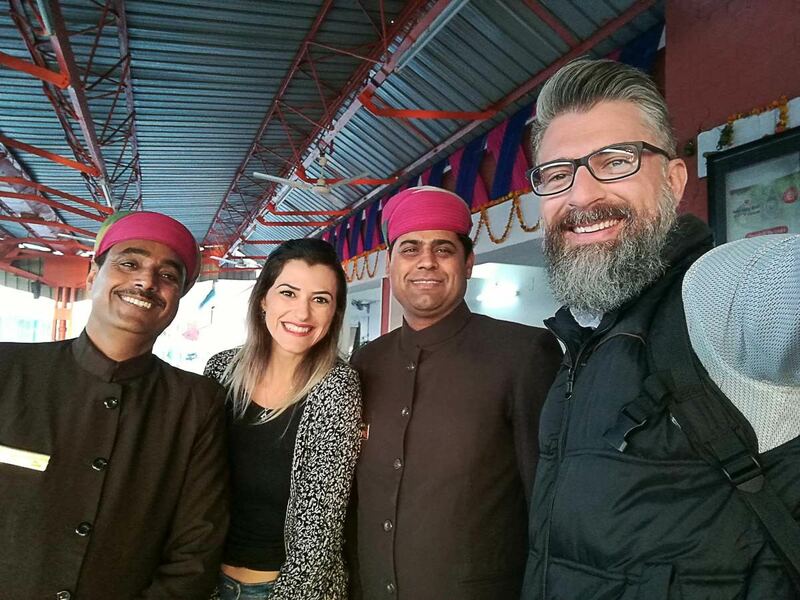 It was time to pack our bags and say goodbye to the incredible Palace on Wheels crew. Breakfast was served at 7 am and by 8 am it was check out time. Our week of royal living and visiting some of the best attractions in Rajasthan came to an end but the memories will last forever. Every day we had air con buses taking us from the train station to the attractions. 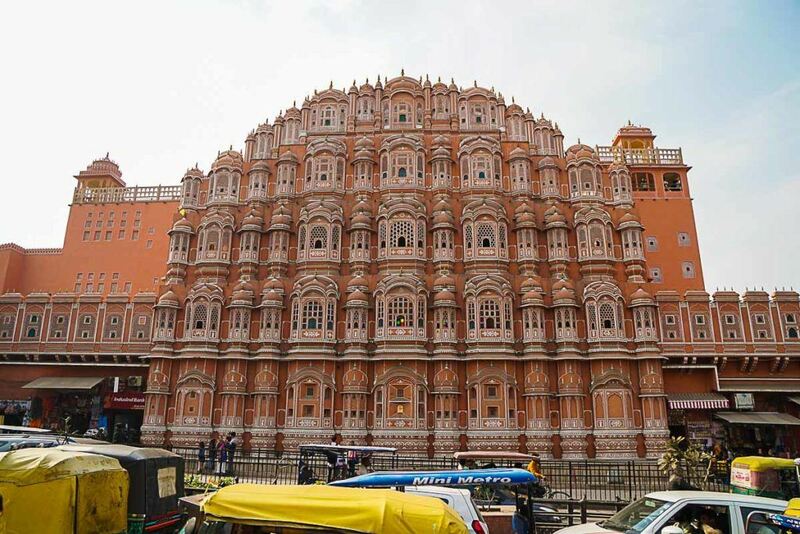 The best part of the tours was the easy and fast access to all the top attractions in Rajasthan and Agra. No queuing, no waiting and no wasting time. The itinerary is so busy that you need to keep a fast pace when visiting the sights. The only downside of the tours was the shopping time. I know many travelers want to buy souvenirs, traditional painting, clothes and crafts… I love shopping as well, but during the tours all the stops for shopping were in touristic shops. We had no opportunity to browse around street shops, bargain with local vendors, check out all types and qualities of products, and experience the real shopping buzz. I know that Palace on Wheels team is concerned about the traveler’s safety and they don’t want us to be harassed by street vendors. But a trip to India is not complete without a walk through markets and all the haggling for souvenirs. The never-ending food starts from breakfast and ends at dinner. The menu has Indian, Western and some Chinese options and if you have any food allergy or restriction they can cook a separated meal for you [you must tell them when booking your ticket]. Breakfast: made-to-order eggs, bacon, toast, sweet pastries, Indian bread, fruits and yogurt. All served with one choice of fresh juice, two choices of canned juice, coffee and tea. Lunch: most of lunch meals were served in hotels and restaurants in cities we visited and all of them were delicious. We had a couple of lunches on the train and the menu was similar to the dinner one. Dinner: most of the dinners were on the train and they were a real feast. Every night there was a set menu with Continental and Indian dishes served in a real ballet of waiters and silver trails coming back and forth from the kitchen while the train was moving. The food was delicious and everything was cooked fresh. The Indian dishes weren’t super spicy, which is good news for most of the travelers. One more recommendation, don’t eat too much, you need to leave space for dessert. On the menu there were traditional Indian sweets and homemade ice cream served along with coffee or masala tea [my favorite]. 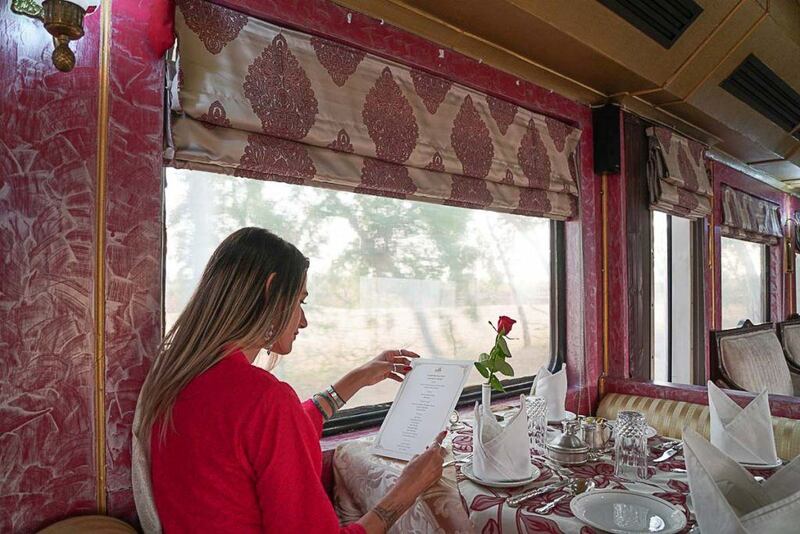 Things you need to know about food on board and at the restaurants: water, coffee, tea and juices served during the meals were included on the Palace on Wheels package. You must pay only for soft drinks and alcoholic beverages. Tea and coffee served in your room are included in the package and don’t be surprised if your butler brings along some cookies or snacks, that’s a little treat for you. The Palace on Wheels price starts at 4,550 USD for a Deluxe Cabin single occupancy in the low season and goes up to 12,600 USD for a Super Deluxe for single occupancy in the high season. If you are traveling with your partner or with a friend you can share the room and the cost, the price for a double occupancy in a Deluxe Cabin is 7,000 USD in the low season and it goes up to 12,600 USD for the Super Deluxe Cabin in high season. We traveled on Palace on Wheels in February and the weather was perfect, but that’s the high season which starts in October and ends in March. The low season is the months of September and April. From May to August there is no service. The luxury train journey starts on a Wednesday at 4 pm and finishes on the following Wednesday early morning. The Palace on Wheels fare includes all the services, tours and food we mention above and they are usually fully booked with months in advance. 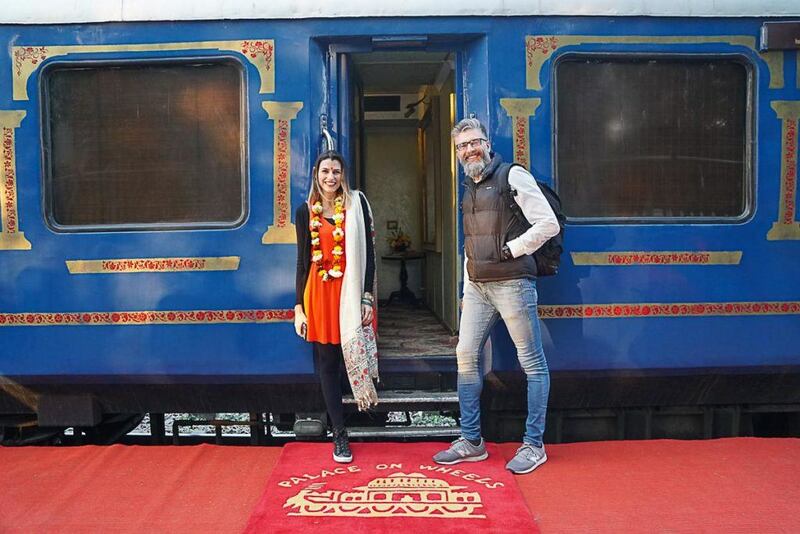 So if you want to have this luxury train experience in India you need to plan ahead and book your room with at least 2 months in advance. You can book your train trip on Palace on Wheels official website. There is a strong tipping culture in India. You are expected to tip your local guide at the end of the tour, the kitchen staff during the last dinner when they come to the dining saloon to say goodbye, and, of course, your butler also deserves some gratitude. Palace on Wheels was everything we expect for our first time in India, a great introduction to the country’s culture and costumes. It’s not a cheap holiday but it’s an intense and unique travel experience, something you would not be able to do by yourself. After the trip you are ready to explore India at your own pace or on board of another luxury train. 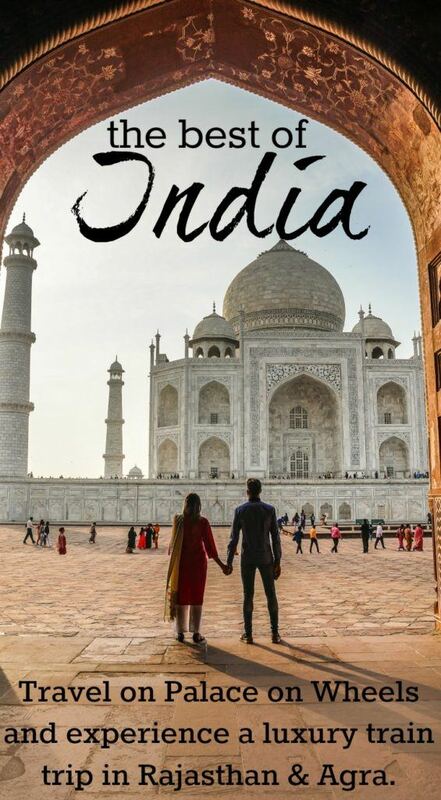 Buy your travel guide here: India Guide by Lonely Planet, this is the best way to find reliable information about the places and attractions in India. 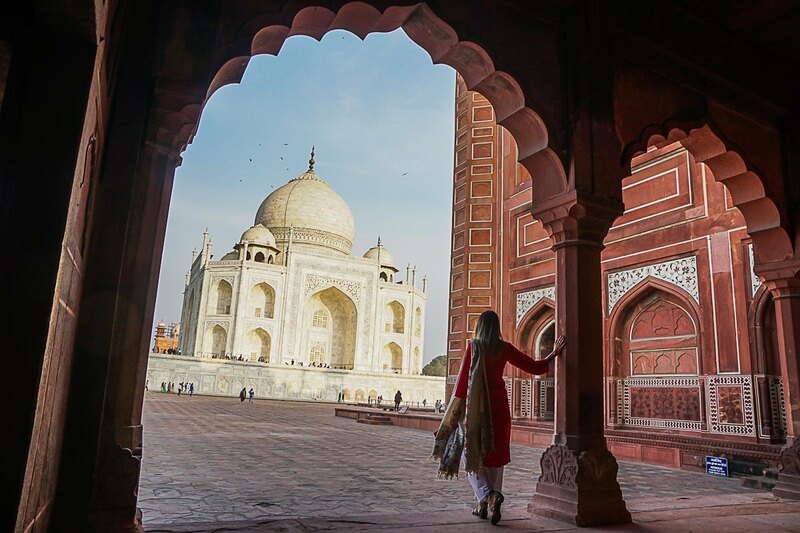 Worried about what to pack for you trip to India? Here are some tips about what to wear in India. Love this post? Pin it for later!!! PS: our Place on Wheels trip was organized by India and Rajasthan Tourism Board, but doesn’t matter who paid the bill you always receive our honest opinion about the services and the destination. Your room was so much more spacious than mine and Pedro’s! I wish we had a desk and space to walk around, lol. Wow what an amazing train ride! Great photos too! Hello, I have checked out your blog, it is awesome. You guys are amazing and your travelling. Palace On Wheel luxury train, You capture all moments seeing these pictures I definitely wanna travel in this luxury train and suggest you to travel with different luxury train like Deccan Odyssey (Maharashtra Tour). This is amazing and get the best luxury facility. Hope to travel with the Deccan Odyssey on our next trip to India! Your article was very detailed, thank you. We are attending a wedding in 4 – 5 months and thought it would be great to also take a train ride afterwards. I Googled to find out what was it going to be like trying to sleep on train. You answered that one very well. I should bring sleeping pills. Palace on wheels will be our train since this is our first visit to India. The Palace on Wheels certainly is the best option for a first timer in India!